Remains of seemingly medieval fortification set in impressive coastal scenery. Normally no access to the interior (English Heritage sometimes arranges for access on specific days) but exterior can be viewed from the SW Coast Path. Notes: The castle is on private land but the exterior can be viewed from the SW Coast Path which can be easily accessed from a car park found off Southwell Road. No sign-posts. Arrow Slots. The fifteenth century tower had multiple holes bored in the thick walls for archers earning the name ‘Bow and Arrow Castle’. Built on top of an earlier fortification that had seen action during the Anarchy, Rufus Castle sits on top of a cliff overlooking Church Ope Cove. Extensively rebuilt in the fifteenth century, its tower is potted with gun-ports giving it a popular alternative name; Bow and Arrow Castle. 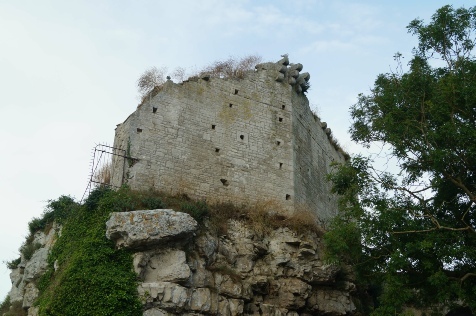 Little is known about the early history of Rufus Castle although the assumption, based on the name, is that the fortification was built during the reign of William Rufus (William II) (1087-1100). A castle certainly existed on the location during the Anarchy - the civil war between Henry I's daughter, Queen Matilda, and her cousin King Stephen over the succession - as in 1142 it was besieged and captured by Robert, Earl of Gloucester. The status of the site for the next hundred years is unknown but in 1257 a Royal licence was granted to Adomar Winton to crenellate the site which suggests that previous defences were ruinous or destroyed. Whether this was actioned is unknown as a further licence to crenellate was granted in February 1259 to Richard de Clare, Earl of Gloucester. Both licences referred to Portland Castle which, it is assumed, referred to Rufus. The structure was substantially rebuilt in the fifteenth century by Richard, Duke of York and these are the ruins visible today. The centrepiece of the new construction was an irregular pentagonal tower that was clearly built on top of earlier foundations. 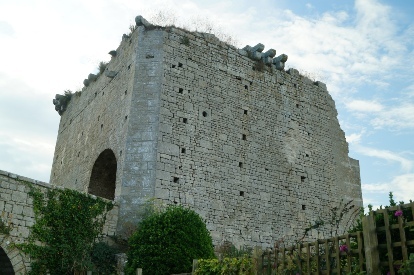 The walls of this tower were punctuated with holes bored through the stonework to provide a means for archers to fire at attackers - a simple design lacking the elaborate arrow slits added to many medieval castles - and which gave the fortification its alternative name of Bow and Arrow Castle. After the Tudor period the castle was allowed to fall into ruin - particularly after the construction of Portland and Sandsfoot Castles by Henry VIII - and eventually the adjacent mansion house known as Pennsylvania Castle became their home.